New York City is no stranger to wind energy. Just this past year, quite a few small wind turbines popped up on roofs all over the city. But when New York's newest, biggest recycling facility decided to build the waste-munching powerhouse of the future, they weren't going to settle for anything less than the tallest wind turbine in all five boroughs. Naturally, I decided to climb to the very top. Sunset Park Material Recycling Facility (or MRF) is the big, bad super facility that's eaten up a chunk of South Brooklyn's Marine Terminal over this past year. Since our first visit a little over a year ago, the complex checked off its final to-dos and has been humming along nicely—churning out chunks of recycled metal and plastic to ship out across the US. 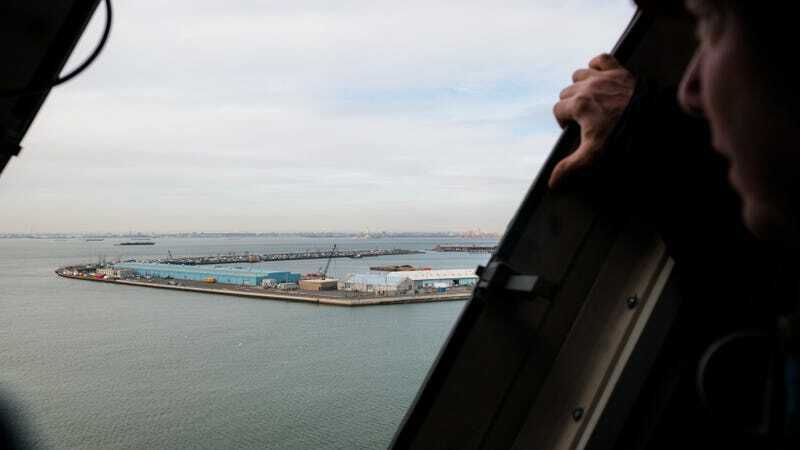 The most notable addition to its arsenal is the brand new, 160-foot-tall wind turbine, built right at the edge of the facility's grounds—the first of its kind ever built here in New York City. A Tour of the Largest Commingled Recycling Plant in the U.S. Built by Northern Power Systems, the turbine was designed to be erected by just three people and a crane over the course of four hours. The whole turbine comes in a single kit with exact instructions to give three people the means to make it happen. Add on an additional eight hours for calibration, and you've got yourself a working turbine. Of course, that doesn't take extenuating circumstances into account, and this particular build, lead by Peter Edlund from Aegis Renewable Energy, took about three weeks thanks to holiday delays and several windy days. At the base, a door similar to what you'd find on a submarine leads inside to the control switches that operate the turbine. The whole thing is actually really simple—there's a switch to turn it on and off, and a switch to control the lights that run up along the inside. It can also be controlled remotely through a computer, where you can also access the massive stores of data the turbine is constantly accumulating. Around the base of the turbine are 100 anchor bolts holding the tower to the ground. Each turbine has a unique foundation, as Edlund explained to me—crews study the location, collect data, and send it all to an engineer who custom designs a foundation for that exact turbine at that exact location. The 120-foot climb to the top is done by a ladder and a cable with a friction stop ascender. The piece will slide up the cable easily but will catch on itself if it feels you sliding down too fast. To climb the ladder, a serviceman clips a climbing harness into the long ladder. (Or at least, it seemed long to me, though Edlund assured me it was actually on the smaller side.) 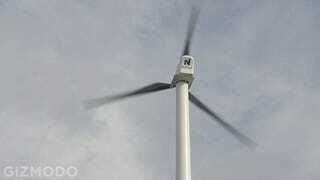 Flip the turbine off, wait a few minutes for the blades to come to a complete stop, and you're ready to go. The climb takes about five minutes with breaks to rest included. At the top is a small pod just big enough for two people. All the inner mechanics of the turbine are squeezed in alongside bolts and clips for the servicemen to attach into. A small hatch on the side of the pod opens to a 12-inch ledge, should you need to work on the blades. Even though it's mildly terrifying to feel the turbine sway ever so slightly in the wind, the views are unlike anything you can imagine. And of course, the climb down is a lot easier. The $750,000 dollar turbine will pay itself off in about five years and will generate about 4 percent of the energy required to run the whole recycling facility. Between the solar paneled roof and the shiny new turbine, the facility is now generating 20 percent of its energy from renewable resources on site. Sunset Park MRF is shaping up to be one of the most advanced and environmentally conscious pieces of the city. Now let's just hope the rest of New York follows suit. Thanks to Tom Outerbridge, Peter Edlund, and Aegis Renewable Energy for letting climb the turbine. Let&apos;s Make TVs Accurate, Not "Enhanced"